This script is similar to GTA:SA Bomb shop at Los Santos. Some of my friends suggested me to do this resource so. - the bombshop garage location is marked within car blip. - Vehicle is required to join the garage. - 500$ of cash is required to plant your bomb. - press F2 to switch your planted bomb on(it takes 5 seconds to blowup). - You can plant a bomb per one vehicle only. - if someone destroyed your vehicle while it's armed with a bomb, the bomb will disappear. 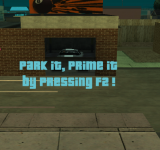 - You have to park your vehicle in order to detonate it. NOTE: this was made in a client side which means reconnecting will refresh all of your data. Contact me via discord if you have a better suggestion that may improve it.